For me, Monish Pabrai is mostly known as the guy who bid a couple of hundred thousand bucks in order to have lunch with Warren Buffet. But actually he has written a book as well. The book claims as subtitle: “The Low-Risk Value Method to High Returns”. The book shows a couple of “real world” examples, where people made a lot of money with somehow limited investments for instance a group of Indian refugees which went into Motels in the 70ties or Richard Branson with Virgin and Lakshmi Mittal. – I personally find the combination of large bets and distressed situations quite dangerous. If you read the book, you could come to the conclusion that it is a good strategy to invest a large portion of your portfolio into a few, highly indebted companies. I would say this is in % of the cases a very good way to lose a lot of money, especially if you do that before a general recession. Overall, I think it is a well written book, which nicely summarizes several aspects of “Value Investing”. In my opinion, it is clearly not any kind of new method, but that doesn’t matter and you will not be producing superior invetsment returns after reading it. But it is a good book to wet ones appetite for value investing and hopefully read other books (Bruce Greenwald, Seth Klarman). Although the book is clearly written for “the average investor”, one should however be careful not to misinterpret the different approaches, especially position size and “distressed” investments. Eine direkt Quelle habe ich nicht. Hier ein link zu seinem Vortrag an der Columbia Business School. In diesem Vortrag erwähnt er immer wieder seine verfielfacher mit indischen Aktien. Dort erwähnt er auch den Verkauf seiner Firma, aber so weit ich es Verstanden habe, war die Summe nicht so groß. Man sollte sich auch bewusst sein, dass Mohnish Pabrai einiges Geld an der indischen Börse gemacht hat. Erst nachdem sein Vermögen Gross genug geworden ist, hat er sich zum “imitieren” entschlossen. Ich denke einen von den Jungs bei Berkshire zu imitieren dürfte nicht unbedingt falsch. Ich kann mich erinnern, als ein junger Mann ein Fond aufgelegt hat, der nur Berkshire Aktien gekauft hat. Deshalb hat Warren B. die B aktien rausgebracht. Letztendlich macht es Mohnish nicht anderster . Die Frage, die man sich stellen sollte, wie hat M.pabrai sein Vermögen mit Small Caps in Indien vermehrt. Hier mal ein Artikel, wie Insider Handel an der Indischen Börse verbreitet ist. Vielleicht hat er ja Wahnsinns Glück gehabt. 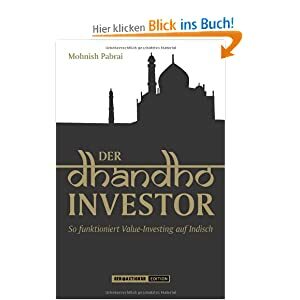 Hast Du zu Pabrai und Indischen Aktien eine Quelle ? Laut seinem Buch hat er sein Geld mit einem Tech Startup in USA gemacht, dass er gegründet und verkauft hatte. One of the highlights of your blog, at least for me, is the weekend read section, where you line up links of interesting weekend reads. But somehow you do not do this as consequently as you used to. I am a lazy guy and I would apreciate the chance to get a list of weekend links that have been filtered and checked by someone like you. thanks for the feedback. Sometimes, especially after 6 months of winter, other things have priority on week ends…. Mohnish Pabrai seems like a nice person. I am not sure, wether this book still represents his current investment-style, which he himself describes mostly with the keywords “imitation” of other investors stock-pick and “checklist”, which in itself is of course nothing new and also a copied screening method. Personally I think marketing your fund with something as basic as a use of checklists is something that would get me thinking. It is something that has been done in the financial industry for such a long time (not to mention other sectors), that as a tool it does not even seem worth mentioning. What you check for and how you do it does of course matter. Mr. Pabrai ist a positive and humorous speaker and a savy philanthropist so I wish him a lot of success with his investments. I read this book some years ago, imho a “nice to read” book but nothing more.